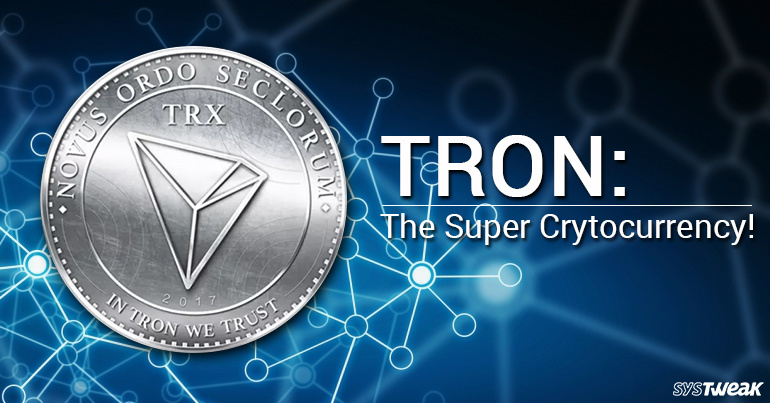 Tron: The New Super Cryptocurrency! Tron. Tron. Tron. we have grown up playing the game Tron multiple number of times. The movie franchise that it spawned is probably the most underrated of the many movies that are being created. Tron Legacy, to this date, remains a personal favorite. Its theme is the inspiration of the popular show ‘Stranger Things’. Why the quick recap on Tron you ask? Well, there is a new cryptocurrency in the market by the same name. Tron. it has broken all the records in a matter of few days since the time that it was launched. Founded by Alibaba creator, Jack Ma’s protege, Justin Sun. He isn’t even 26 years old and has featured twice in Forbes list of 30 Under 30 brightest young entrepreneurs. Talk about potential. See Also: Blockchain: Midas Touch Strikes Again! Tron, (probably named after the cutting edge technology game) packs quite a punch with the philosophy which is behind its creation. It aims to use its platform as a means of freeing the internet from the big corporations like Google and Apple etc. It aims to provide free person to person entertainment between the creators and the viewers. A decentralized blockchain that shall enable a free market and sense of community. Data liberation: Opening its platform to provide free and uncontrolled transmission of data. They aim to promote content that includes characters, pictures, audio and video. They also can be uploaded, stored and spread across multiple distribution networks. Personal ICO (Initial Coin Offering): While an individual can easily and freely distribute digital assets in the form of ICO, others can probably enjoy the benefits and services that are brought on due to the continuous development of contributors’ data by legally purchasing digital assets. Infrastructure: A distributed digital asset will be equipped with a complete set of decentralized infrastructures, including distributed exchange, autonomous gaming, forecast, and game system. As a Blockchain based, open-source protocol for the global digital entertainment industry (or how it describes itself) there is nowhere else for Tron to go but up. It has already broken records with its cryptocurrency. It has surged a massive 138% in the last few days. TRON supports various kinds of Blockchain networks and smart contract systems, which include Bitcoin, Ethereum, EOS, Qtum, and other public Blockchain. Keep your eyes open for this one folks, cause its a Super Trouper.